Florida Natives was designed utilizing an existing piece of farm equipment. 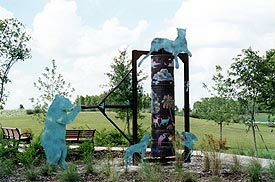 The equipment was embellished with animals native to Florida that inhabit lakes, land, and sky. 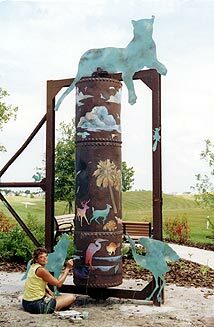 Local school children visit the sculpture and are asked to identify these animals and detail their characteristics. The community's focus is to promote understanding of the fragile ecosystem yet promote interaction in a non-destructive manner.